Autumn used to be my favorite season. I once pitied the people who lived in areas of the country which don’t really have a legitimate autumn. Since moving to a place with severe winters, I’ve lost a little enthusiasm for the fall (knowing what’s right around the corner–four months of frigid air, ice and darkness–prevents you from enjoying it as much). Still, on its own merits, autumn can be a wonderful time and probably the most beautiful season of the year, especially if you live in a place with a lot of deciduous trees. 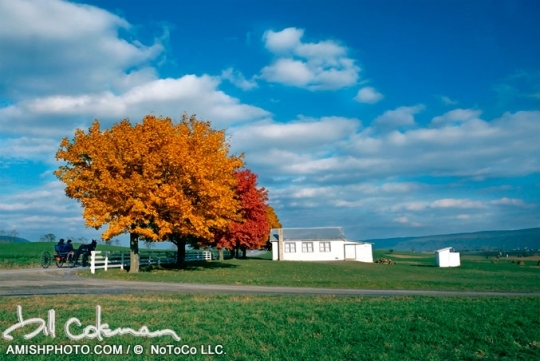 Today we have a few photos of autumn in Amish Pennsylvania, courtesy of amishphoto.com, featuring the work of Bill Coleman. 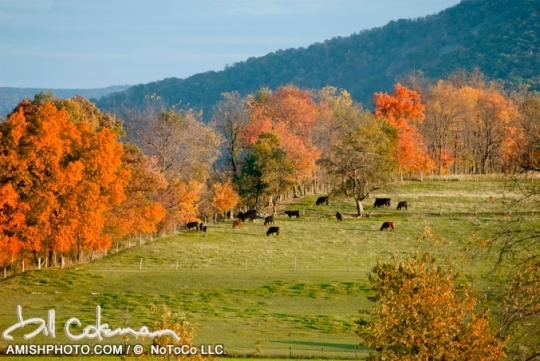 If you enjoyed these, you can view more Autumn photos or Amish harvest photos. You can also read an interview with Bill and Noah Coleman. Shom, thanks for mentioning the buggy. I’d overlooked it the first time and had to go back to the pictures after reading your comment. That’s probably my favorite of this batch too Shom. I don’t even know if that’s an Amish home, but it just seems to say “history”. Unfortunately, that house is no longer standing. It went into disrepair and then was torn down. Glad that Bill got a good picture of it. some of the local artists have also painted it. Thanks for the info, Claudia. That’s too bad. I guess it happens. This one looks like it had some years on it. Another thing I love about PA–lot of beautiful old stone homes. Thank you for the beautiful pictures. My favorite is the kitty standingon the pumpkins. I enjoy the fall-but it seems to be so short then that white stuff comes around. 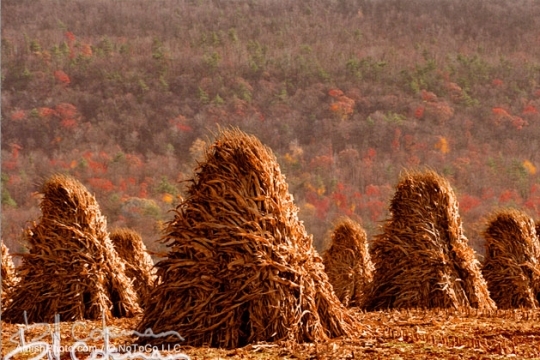 I really like the photo of the stooked corn. It has been a few decades since it was done where I grew up. 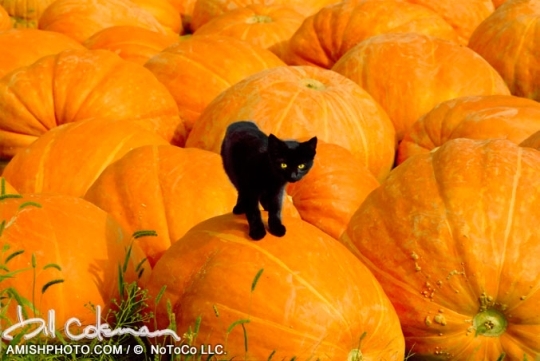 The photo of the black cat on the pumpkins is sweet. We have a wee black cat here, named Kaos. My favourite cat of all time was Jacob, another black cat. Thank you so much for sharing these. They seem to speak softly to my soul! I love the beauty of Fall – “For the Beauty of the Earth…” I am also grateful for Bill’s talent. What a gift. You said it Amy Jo. Really enjoy those pictures. Thank you for having them. Gorgeous autumn photos! How can one not love this season, even when we frigid temperture will follow…and we do always have the hope of spring. Thanks! I’ve done the jigsaw puzzle of the photo above the pumpkins and kitty. There were several Bill Coleman puzzles to choose from about 10 years ago. I don’t know if one can still purchase them? Yes, happy to say that Puzzles will be back, soon! Beautiful photos. Makes me miss the changing seasons. Used to love seeing the leaves change color just by looking out the window of my parents house. Now I live in a state that doesn’t really have fall. Autumn IS my favorite time of year. After all, Spring and Summer (Fall, too) bring threats of storms and tornadoes and depending where you live, even hurricanes—and Winter is ALWAYS around the corner in MY part of the country, so why NOT embrace and enjoy this beautiful season while it lasts? It’ll be gone too soon, which makes it that much more precious to me! I don’t know if anyone knows anything about this, but it seems to me like many trees up my way (Northern Illinois) are holding their leaves longer this year. That’s not necessarily good—we had a beautiful Maple that did that one year and died the next. Does anyone know if our drought (this past summer) is why? We already lost 7 evergreens, and I’d hate to lose more of our deciduous shade! As for season favorites, I’d probably say Spring, Autumn, Summer, Winter, with autumn and summer close to interchangeable. The “grey day” photo above is a favorite. I’ve often wondered how professional photographers like Bill get such vivid colors and sharp images. There is some sort of alchemy to it I’m convinced 🙂 Either way love the results. Ditto about Autumn being a great season, and its my favorite as well. Coming from California, made me really appreciate Autumn in Ohio last 20 yrs. I try to capture it with camera to share with my sister but just can’t do it justice. Wish Autumn lasted longer! Holmes County OH is specacular right now, height of tourist season too. That little black cat reminds me of ours who passed last October :(, she cuddled on our scarecrow on our porch every Fall. Alica Mary, I heard that the leaves should come off easier because of the drought, if I heard the weather man correctly-not the other way around. Ours are very vibrant this year in OH, seem to be surviving the gusty windstorms better than usual. Thanks for sharing these photos! They bring a sense of calm to my busy life. I like photo #4 because it reminds me of Virginia, and the kitten photo because it makes me smile. I also like the silhouette of the buggy driver in photo #5. Thanks for showing these, Erik. @ Erik – Looking at Mr. Coleman’s wonderful photographs I could not help but notice that many of the little girls are wearing their hair plaited. I was always taught that plaiting/braiding was “proud”. Is this a recently relaxed rule or just a particular groups allowance? Traci some Amish parents do this with their little girls’ hair when they are very young. Not sure that the more conservative groups would, but I’ve seen it in mainstream communities PA and Indiana for instance. I’m guessing Noah is Bill Coleman’s son? 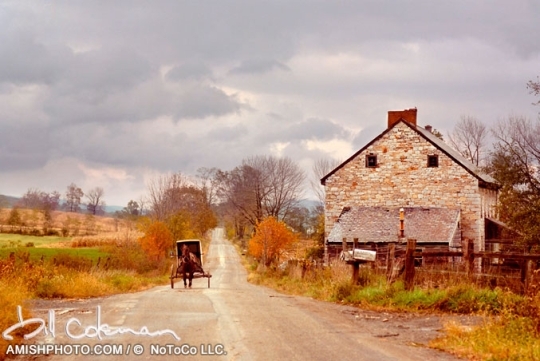 And I know Bill Coleman won’t tell where he takes his photos ( and I don’t blame him a bit ), but do you have any idea what type of Amish they are – Swartzentruber, Old Order, Other? It seems like I read that the group he photographs is a stricter district(s) than many others. I love his photos. I have one, as well, it’s a photo of the side of a red barn, with a blanketed, dark bay horse standing in the snow, tied to a hitching rail. 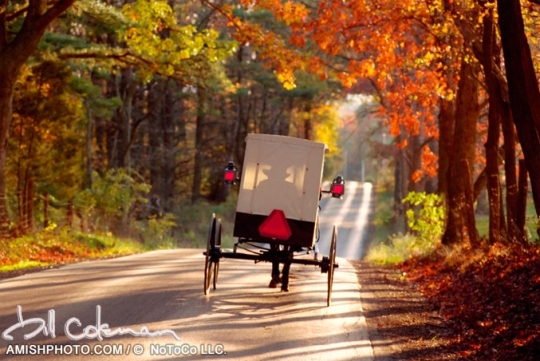 Hi Ava, yes Noah is Bill’s son, here is an interview from last year with comments from both of them: http://amishamerica.com/bill-coleman-on-amish-photography/ They are beautiful photos, and the interview reveals some interesting background on how they were taken. I was sorry to read of the death of this talented man on Tuesday of a heart attack at age 88. My thoughts are with Noah and family as they continue finding strength when it is needed most. Maggie, thanks for the note. This is the first I’ve heard of it. I second all you say.